The Queensland Government’s commitment to reducing mine dust levels announced today will save lives by reducing future cases of mine dust lung disease. The CFMEU Mining and Energy Queensland District has been leading the campaign to reduce exposure limits for respirable coal dust in the state’s mines and is pleased the government has taken action. However much more is needed to diagnose and support workers already suffering from mine dust lung diseases like ‘black lung’, silicosis and emphysema, said CFMEU Mining and Energy Queensland District resident Steve Smyth. “Tragically, poor management of dust levels and medical assessment or workers has seen a sharp rise in workers being diagnosed with chronic and fatal mine dust lung disease,” said Mr Smyth. The only way to reduce the future incidence of mine dust lung disease is to cut the levels of dust workers are exposed to and we are pleased the Queensland government has listened. The Queensland Government has announced it is amending the Coal Mining Safety and Health Regulation 2017 to reduce exposure limits for respirable coal dust at mines from 3.0 to 2.5mg/m3 from 1 November 2018, with a commitment to further reduce exposure limits to coal dust and silica in early in 2019 at the completion of a Safe Work Australia review. Mr Smyth said the changes on dust regulations were a first step but more needs to be done to match world’s best practice on managing the risks surrounding coal dust and silica. “We know black lung is a condition with no cure so prevention is the key to reducing the incidence of this disease,” Mr Smyth said. • Independent medical assessments and respiratory checks for mineworkers. • Independent dust monitoring in mines by Simtars (Queensland’s Safety in Mines Testing and Research Station). • Mobile health units to provide X-ray, spirometry and other assessments. • Legal protection for affected workers’ employment. • A victims assistance fund to cover mine dust lung disease victims’ medical costs and compensation. 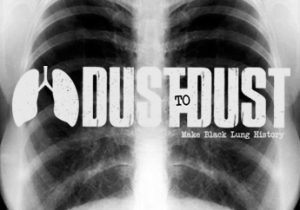 • Recognising mine lung dust disease deaths as work-related fatalities.